The meetings opened a series of activities under the first Senior Officials’ Meeting of APEC (SOM-1) scheduled to run until March 3. The groups include the Human Resources Development Working Group (HRDWG), Emergency Preparedness Working Group (EPWG), Anti-Corruption and Transparency Working Group (ACTWG), Policy Partnership on Science, Technology and Innovation (PPSTI), Intellectual Property Rights Experts Group (IPEG), Experts Group on Illegal Logging and Associated Trade (EGILAT), Chemical Dialogue (CD), and Business Mobility Group (BMG). Participants proposed new measures to boost cooperation in training regional young scientists, promoting technology transfer and application to reduce natural disaster risks and facilitate the mobility of entrepreneurs, as well as promote the legal trade on timber products and strengthen connectivity of regional supply chains for mutual sustainable growth. They also shared experience in developing human resources in intellectual property and increasing public engagement in corruption prevention. 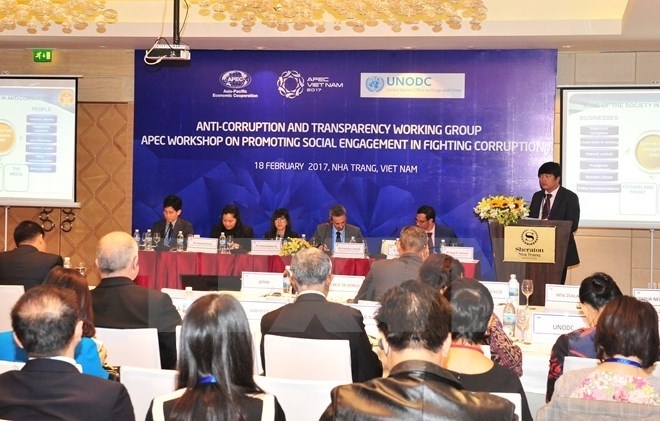 Chief of the Vietnamese Government Inspectorate Phan Van Sau addressed a workshop on enhancing the involvement of society in preventing and combating corruption, during which he highlighted Vietnam’s positive changes in the field. Deputy Minister of Science and Technology Tran Quoc Khanh attended a meeting on increasing competitiveness, innovation and connectivity of the PPSTI, while Deputy Director of the General Department of Irrigation under the Ministry of Agriculture and Rural Development Tran Quang Hoai chaired a meeting of the EPWG. Other Vietnamese ministries and agencies proactively contributed their initiatives, including the development of a creative and innovative business ecosystem in the APEC member economies. In the days to come, the panels will continue discussing collaboration priorities for this year. Established in 1989, APEC now comprises 21 economies, namely Australia; Brunei; Canada; Chile; China; Hong Kong, China; Indonesia; Japan; the Republic of Korea; Malaysia; Mexico; New Zealand; Papua New Guinea; Peru; the Philippines; Russia; Singapore; Chinese Taipei; Thailand; the United States; and Vietnam. Vietnam joined APEC in 1998, and hosted APEC in 2006.